Learn the stingray shuffle. You shouldn't have to get barbed to learn some stingray info and facts. Learn the stingray shuffle to avoid injury during your Florida beach vacation. This isn't something you will get directly from the hotel/motel/resort staff. You will have to ask for it. Why? Well discussing encounters with lazy, but dangerous sea creatures would be bad for business! Some of the more "up front" places of accommodation might have some little business-sized Fact Cards made up behind the front desk. However, you will never see any big warning signs in the Lobby about Stingray Season being between April and October, which is when many guests come for their Florida beaches vacation. It will be up to you to make some pointed inquiries to the staff. Remember, they are inside with shoes on...you are out on the beach and playing in the ocean. Who do you think has more of an immediate concern? Besides, anytime a guest gets barbed, they always say, "Well, it was an isolated incident." Actually, since they are so familiar with these "isolated incidents", they could have easily discussed with you the best way to prevent such a painful wound. Let me be the first to tell you that the Shuffle will NOT guarantee you won't get barbed, but it is the most common proactive approach when swimming in the Gulf of Mexico...or any of the other Florida waters. They cover themselves up with sand and change color to blend in with the bottom. Just like you, they don't like to be kicked or jumped on to wake them up. They get real testy and arc their protein-sheathed stinger over their back, or whip it out violently to nail whoever disturbed their summer nap. This causes an extremely painful injury. It can ruin a good day at the beach. The Stingray Shuffle will go a long ways to preventing an injury. It is not foolproof, but I do it all the time and I have never been stung. All you do is "scoot" your feet along the bottom the minute your toes hit the ocean water. I try to it do hard enough to "make noise". The vibrations frighten rays and they will move off away from what they perceive as threatening activity. They don't attack. Remember, they're lovers...not fighters. 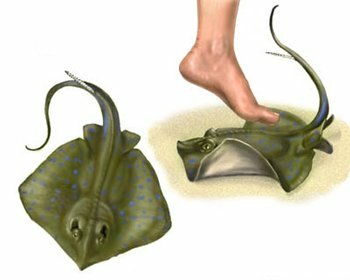 * If you are here on a Florida beach vacation, just know that the place you are staying is probably real lax about letting you know to be aware of getting a painful injury from one of these sea creatures. * Do NOT be mindless when entering the water. Make it a habit to look down to see if any of these guys are partially buried and always shuffle. * Stingrays like to hangout on that little 3" to 4" shelf where the water breaks onto the shore. You'll be able to see them, and chase them away by scooting your foot towards them. It can get pretty murky there after a wave breaks, so take a few moments to look before you head into the surf. * You do not have to live in constant fear that your next step in the ocean will get you nailed by a painful sting...but you do need to be vigilant about "shuffling" across the soft bottom. Signs to keep you from being injured are posted at most public beach access entrances...but rarely at resorts or hotels. 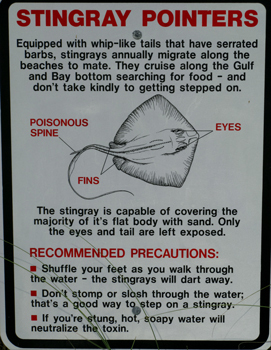 Just because you do the stingray shuffle doesn't guarantee you won't get barbed! I hope this short page has given you some basic information about these small and shy sea creatures.